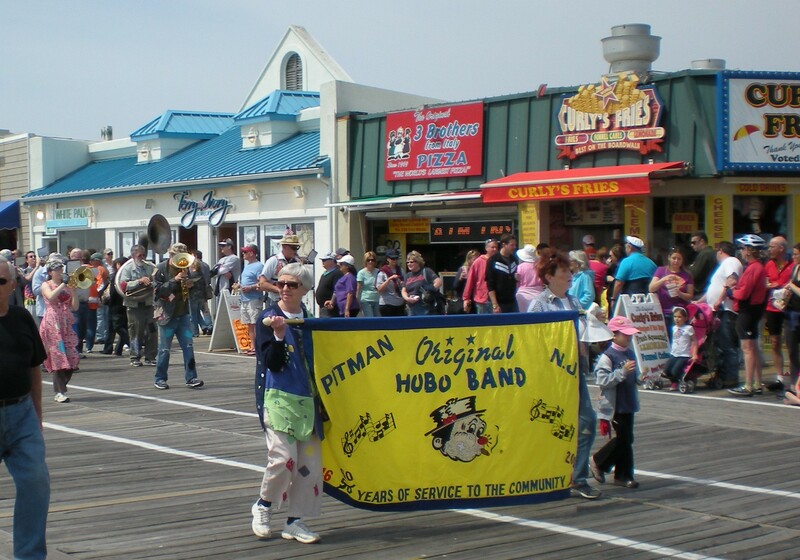 Small cities have big imaginations, and Ocean City, NJ (OCNJ) is no exception. 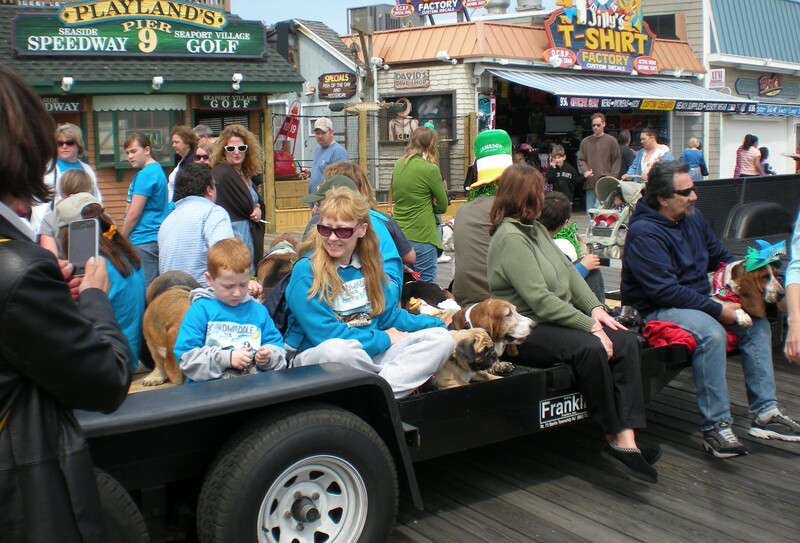 To launch its summer season, OCNJ holds its Annual Doo Dah Parade the first Saturday after Tax Day in April. It’s a ridiculous fun event not to be missed. We celebrate because taxes have been paid, and summer is just around the corner. “Hallelujah” from us beach lovers. 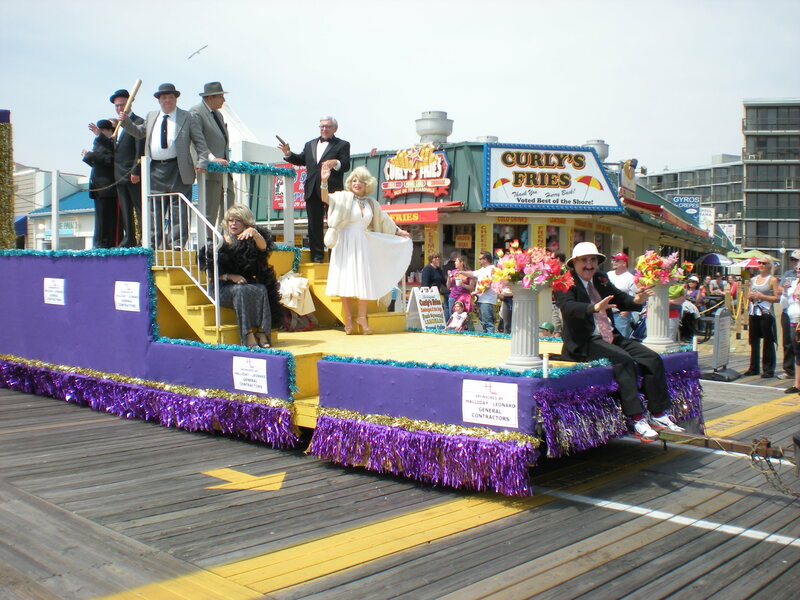 Doo Dah Parades have a history in other areas of our country (Pasadena, Columbus), but they don’t quite measure up to the Ocean City parade. 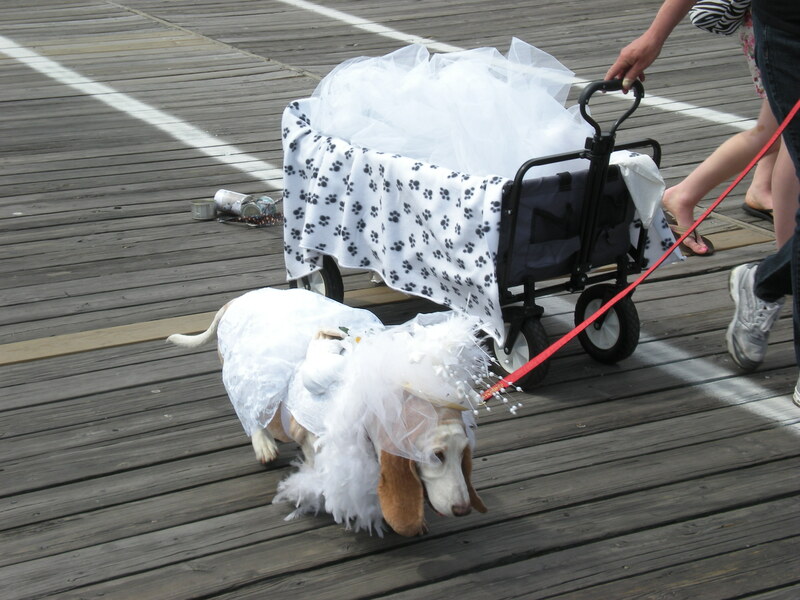 The Ocean City spectacle parade always has several lowpoints highlights. The first is the appearance of a nationally known celebrity as Grand Parade Marshall. In past years, Carol Channing, Mickey Rooney, Larry Storch, Captain Kangaroo, and Soupy Sales have been our esteemed parade leaders. This year, Chuck McCann, TV and stage actor and vocal artist, did the honors. Abbott and Costello, Groucho Marx, Harpo Marx, Jack Benny, and Lucille Ball regularly appear in the parades. Okay, so they are impersonators, but who knows the difference? 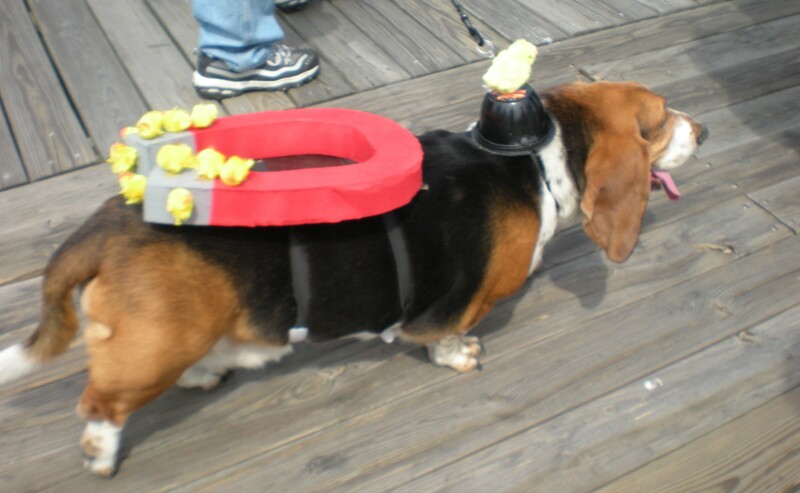 The second, but most important feature, basset hounds, garbed in their tax season finery, strut their stuff. 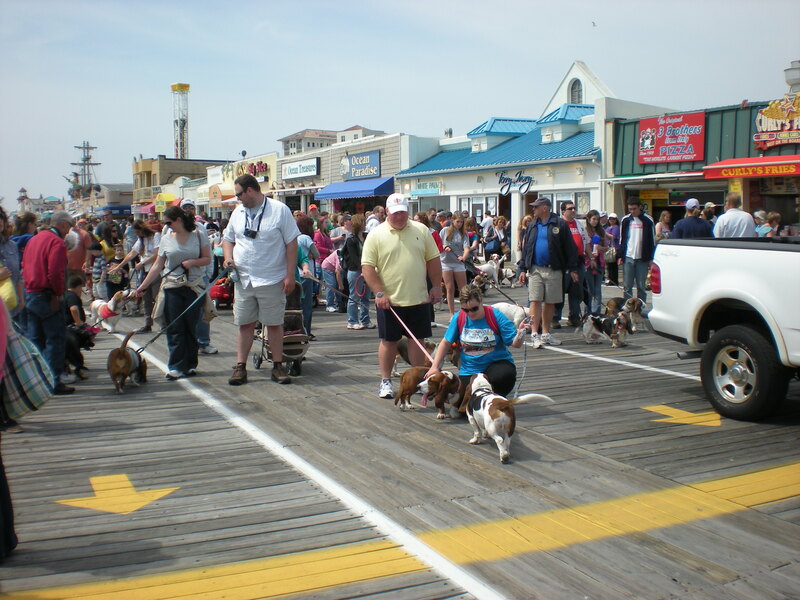 Well over 400 of these floppy-eared, waddling doggies entertain the crowds as they meander huff and puff wobble down Asbury Avenue and the Boardwalk. 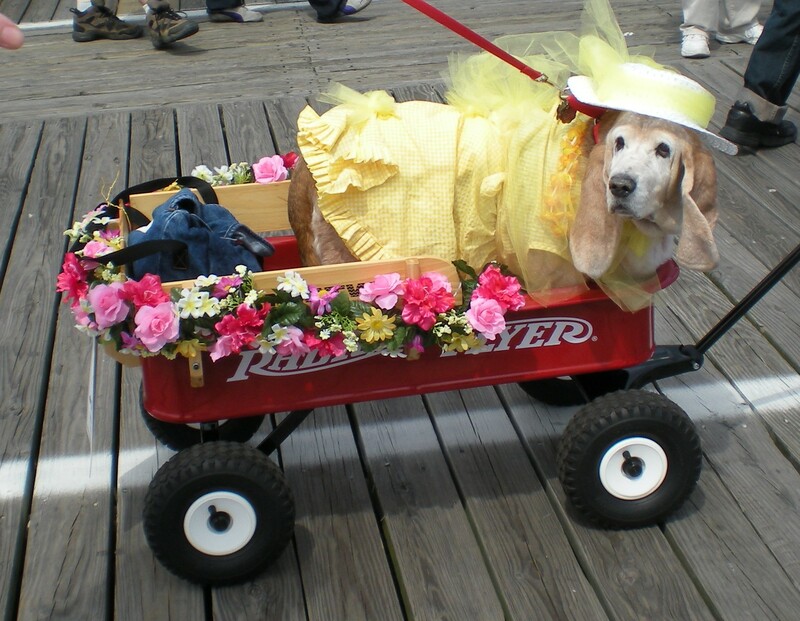 Some bassets sport humiliating outrageous costumes that make them want to run and hide their owners think are cute. Others, rigged up in more sartorial splendor, reign with an air of pomp and cirumstance, all the while looking down their snouts at those lesser-dressed, riff-raff, tag-a-longs. Take a look. Honest now. 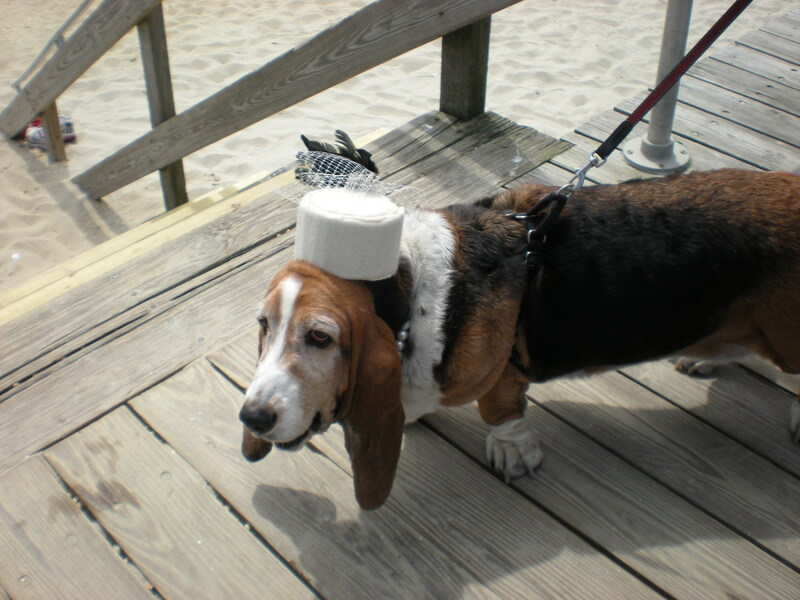 Would you wanna waddle in a parade wearing this ridiculous hat? I wouldn’t wear this even for a high-falutin’ society wedding. I. Will. Not. Go. One. More. Step. And. You. Can’t. Make. Me! This parade is just so much excitement. I just can’t handle it all. Lucky I have a slave owner to carry me when I get tuckered out. Here’s the deal. 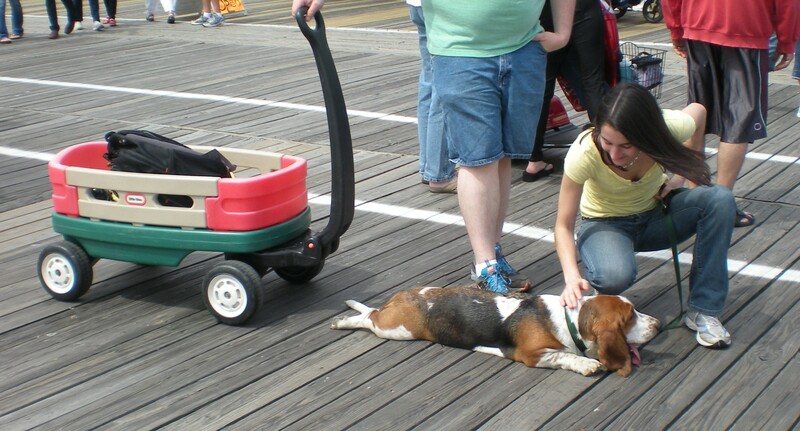 If you flop down and refuse to walk, someone will come along and give you a lift. Got it? Here’s another possibility. 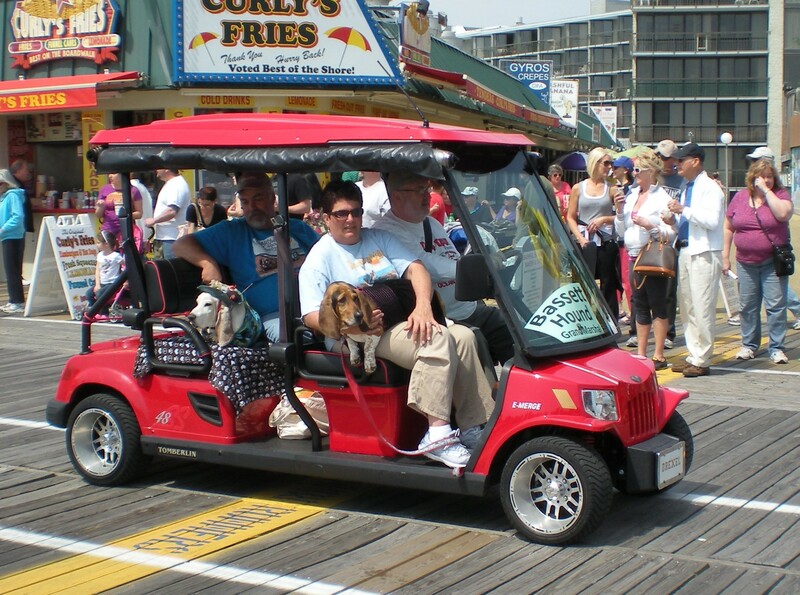 Kiss up to the Grand Marshall and get to ride in comfort and style in the limosine parade golf cart. Of course, any parade with 400 to 500 dogs is bound to be a bit chaotic at points, and this fiasco procession does not disappoint. And, don’t forget. There are awards: “The Golden Hot Dog” award for local tri-state (NJ/PA/NY) participants and The “Double Doggy Doo Dah Glutton-for-Punishment Award.” How do you get the 4DGPA? Participate in another Doo Dah Day Parade somewhere in the country, and the honor is all yours besides, no one else wants it. And there’s more. People Furry fellows and felines of all shapes and disguises flounce in this parade, too. 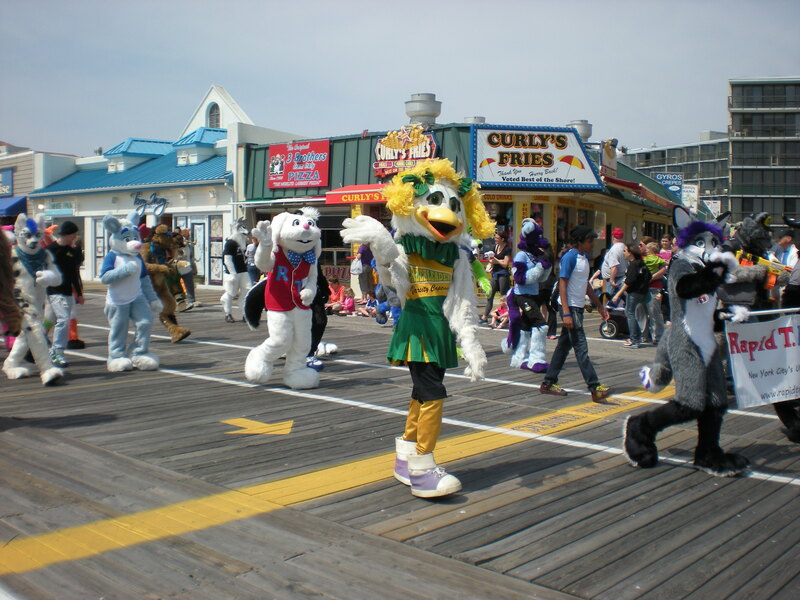 Every year Sir Rapid T. Rabbit sponsors the annual furry (and a few feathers) critter consortium in the parade. Marching bands and vocalists Riding bands and musical groups roll up the Boardwalk throwing out sounds and love to the crowd. 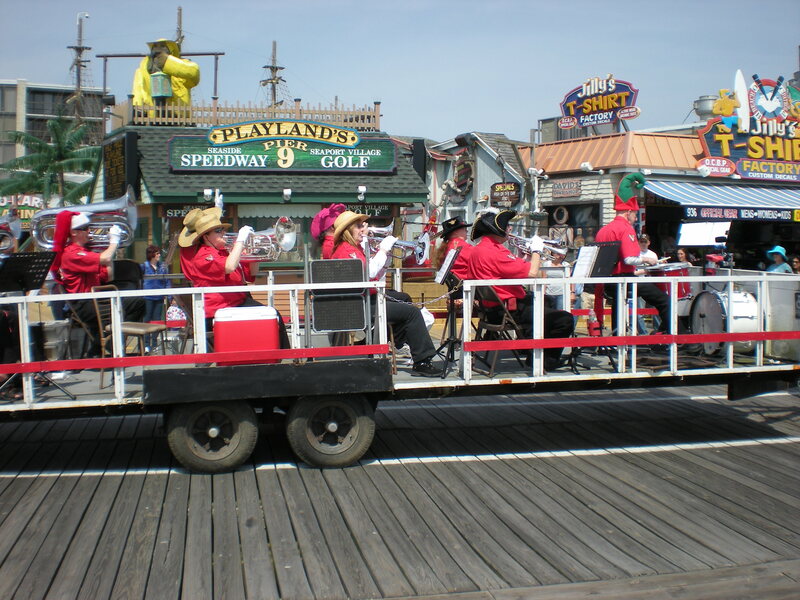 Sometimes they throw Schriver’s, Fralinger’s, and Steele’s Ocean City Salt Water Taffy to the sticky-fingers eager hands of candy-eaters freeloaders parade guests. If you can’t afford wheels, you just have to do it the old-fashioned way and walk. 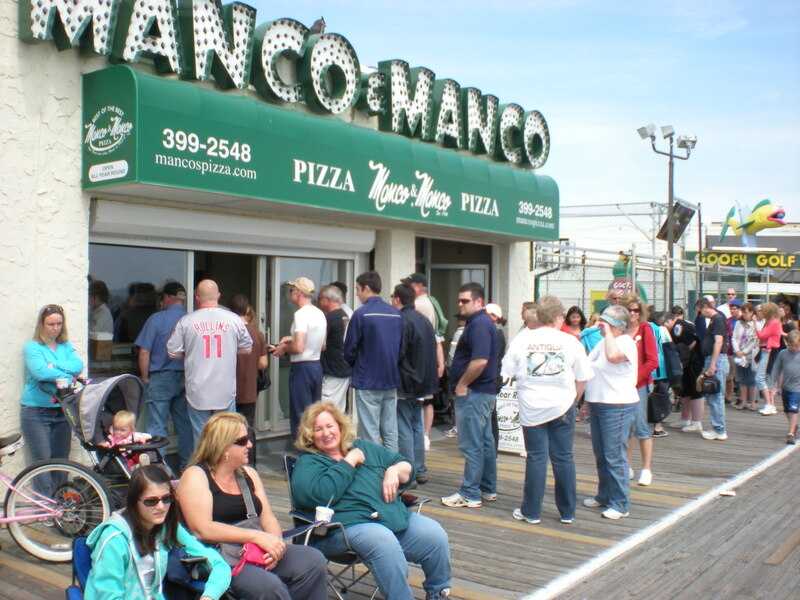 And when the parade’s all over, you get to have pizza at Manco & Manco. Okay, so there’s a line. What did you expect? It’s a warm, sunny Saturday in April. 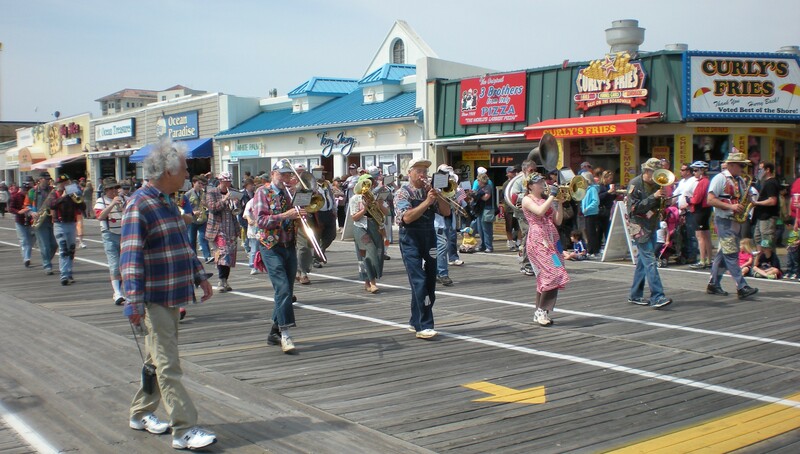 There’s been a parade on the Boardwalk. And people are out on the beach sticking their toes in the water. Of course, there’s a crowd…and a line. The wait is worth it. What kind of pizza do you want? Oh, I forgot to mention one thing. 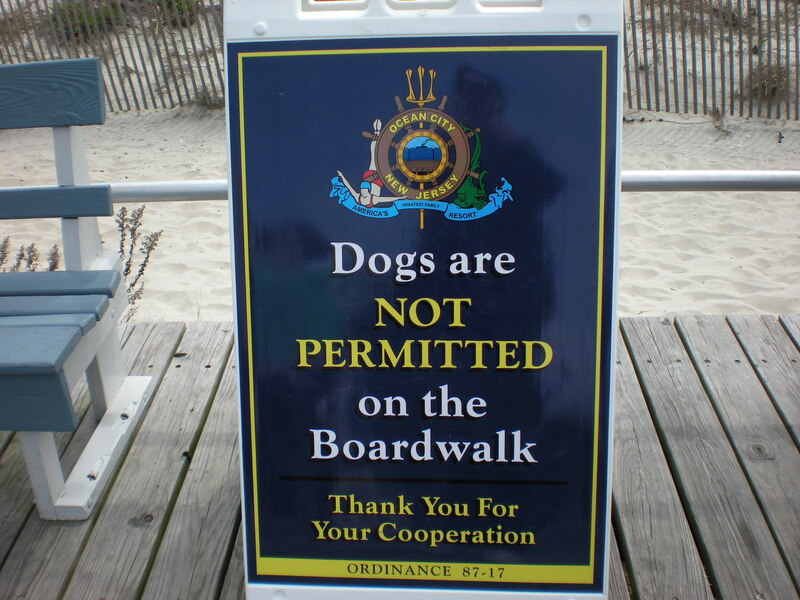 Dogs are not allowed on the Boardwalk. Oh well, I guess that once you’ve paid your taxes, anything goes! 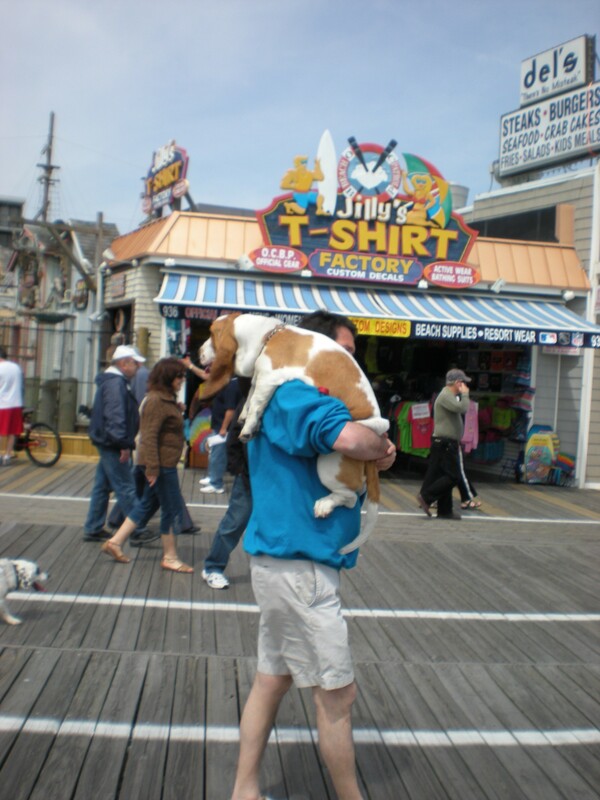 Besides, for those lovable basset hounds, OCNJ will just look the other way. 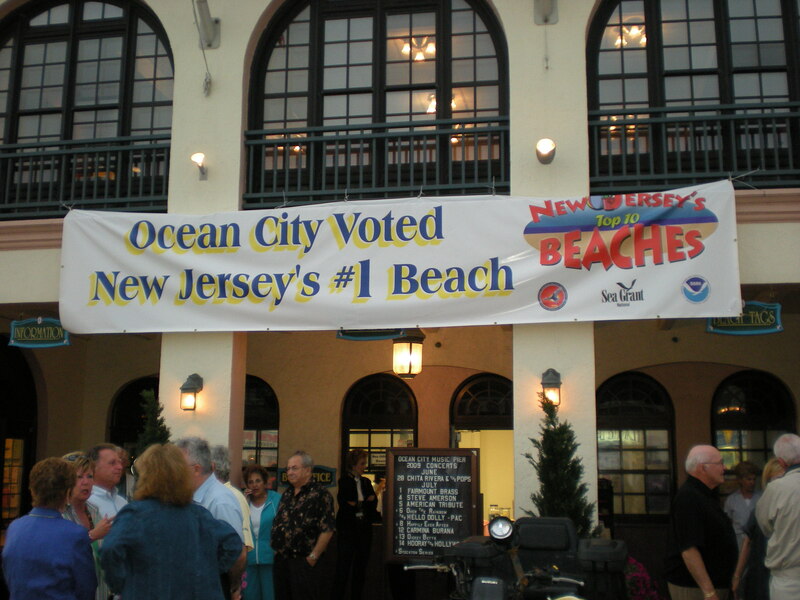 Want to read more posts about Ocean City? Click here, here, and here. What’s your favorite kind of parade? Bassets are a favorite of mine. How marvelous to have an entire parade of them! This parade is a barrel of laughs. The bassets are so lovable. Hi Don, This is always such a fun event. We look forward to it every year. What are you up to these days? I agree. This parade looks completely ridiculous and totally FUN! 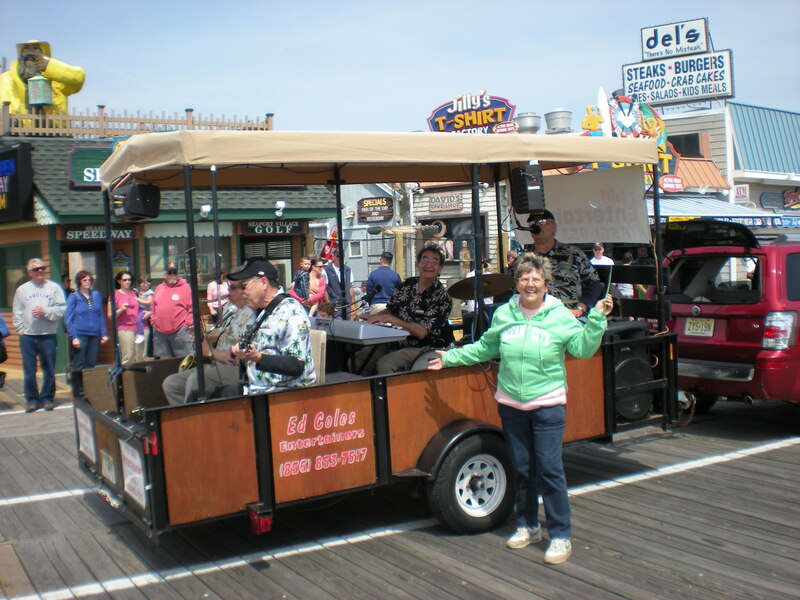 Doesn’t Stephanie Plum (Janet Evanovich) visit Ocean City in one of her novels? Hilarious! And so cute. I nominated you for the Very Inspiring Blog Award. Keep up the great work!